Earlier in 2012, the bird control company – Birdblock, based in Lidingö, Sweden – began working with the Stockholm-Bromma Airport to deal with pest bird infestation. The airport authorities were concerned about the constant disturbances (and dangerous interferences) caused by pest seagulls and blackbirds in the airfield. The Birdblock team helped the airport install a Bird-X Mega Blaster PRO on the property to repel the birds from the area. The Mega Blaster PRO is a powerful sonic bird control device that broadcasts bird distress calls to create a “danger zone” that frightens pest birds and conditions them to avoid the area for good. It consists of a 20-speaker tower with two high-output amplifiers to repel birds up to 30 acres (12 hectares). 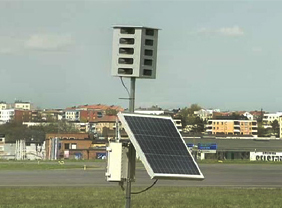 The Stockholm-Bromma Airport began testing the unit in May and started using it regularly in June of 2012. Johan Bolin of Birdblock reports that Swedish airport authorities are “very happy with the results” of the Bird-X Mega Blaster PRO. In fact, they plan to purchase and install the devices for two more Swedish airports – Visby Airport and Malmö Airport. To find out more about airport bird control and other Bird-X products that work in aviation applications, visit our Airport & Aviation Bird Control page.